c. 520 - 500 B.C. 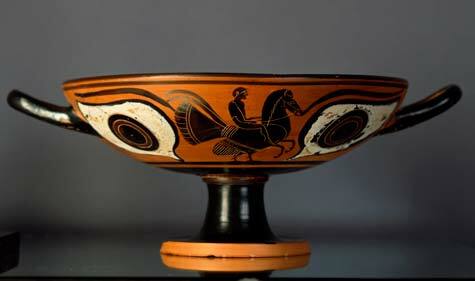 This kylix, or drinking cup, is one of about 30 vessels traditionally classified as the Group of Courting Cups. They are all eyecups of consistent shape, typified by a shallow bowl, plain lip, and a short, splayed foot. Appearing on both sides of the kylix, the eyes become part of a face when the cup is tipped to drink; the handles mimic ears, and the foot, a nose. The eyes may be merely a decorative element or may be an attempt to ward off evil and bad fortune. Also depicted on this kylix is a male youth riding a hippalektryon, a mythical creature that is half horse and half rooster. Most hybrid creatures seem to have been introduced to Greek culture from the East, but the hippalektryon has no known prototype. The animal appears regularly on Attic vases from 550 through 500 B.C., but is scarcely mentioned by Greek writers of the day.